Sponsored by Fred J. Miller Inc.
Few Methods Courses at the Graduate or Undergraduate levels address the Visual issues facing the contemporary Band Director. While many insightful lectures have been given regarding appropriate repertoire enrichment and technique development, rarely do these include the concerns and requirements of visual presentation. The initial impact of your group is based upon perception and expectation, each of which must be shaped by the Director to further the growth of the program, its musical trajectory, and the needs of community and members. The band’s look and character become an indispensable brand that has immediate impact and longevity. Year after year, season after season, the look of your group can establish the continuum on which you establish long-term growth. The main component of your band’s visual identity is the uniform and performance wear worn by the members. 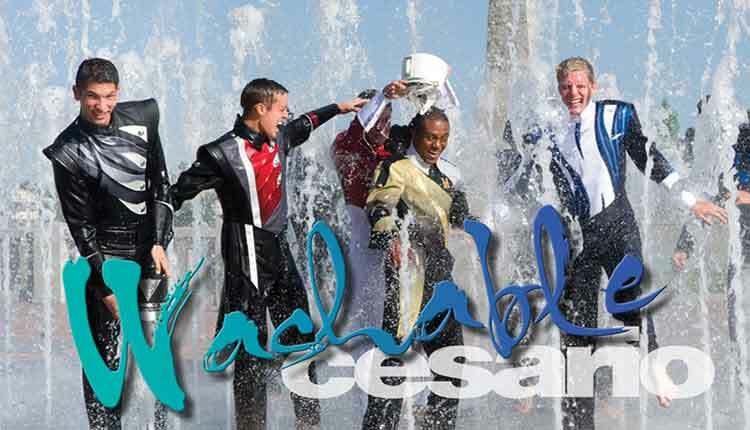 Whether for the concert stage, the parade route, the half-time show, or the competitive field, the “Clothes Make the Band” and the “Uniforms Make the Brand”. Design and choice of these garments is essential to the very essence of your band’s presence. The image portrayed must be consistent with the musical exploration you instill. The stature and clarity of the uniform is the very declaration of the group’s character and excellence creating a brand unique to you and your environment. While most bands must reflect the colors and traditions of the school or organization they represent, often the application can be innovative in spirit while reverential in tone. While you must be aware of what the band has previously worn and what mascot or title the band may carry, you can still project an image that contains the elements of modern national-caliber standards, conveys the group’s individual style, and allows the members to look and feel strong, confident and comfortable. To bring the true character of the band to life within the uniform, it is essential to imagine a complete design process, as intricate as musical composition. What is the nature and shape of the work? What motifs will be used and repeated? What colors and textures best reveal the intent? Simply relying on old forms and tired models of “Band Uniforms” will consign your group to the “Band Geek” stereotype. After all, if any uniform component piece can be stored in a data base and added, haphazardly, to a computerized photo-montage, chances are it is not new, interesting, or exclusive to you. That sort of laziness represents ease for the manufacturer, but not the essential “big picture” overview needed to capture a vivid image in order to create a powerful brand. Before you start picking out sashes or belts or spats, consider engaging in a program of design using design professionals to facilitate your vision, creating from your needs a vision of focus and clarity. After all, if you were designing your dream home you wouldn’t go to the window or paint salesman first. You’d go to the architect, engineer and builder. Visibility refers to our ability see the band in context. This usually requires considering the distance from the audience, and the venues in which the band performs. Size, depth and scale of the arenas in which you perform, the type of lighting, whether they are indoors or out, all play a part in making choices specific to you and your brand. For example, remember the “50 Foot Rule”. If you can’t see it at fifty feet, you can’t see it! While the construction of the garment requires fastidious detail, the visibility of the garment requires clarity and focus. Always ask “What do you want me to see?” Then close in on that one highlight or small combination of elements. Your designer should know the power of color, the variety of available shades, and the variables of background neutrals. Just combining your favorite hue with black as opposed to white will change how the audience perceives the color strength and emphasis. Knowing what metallic accents or remarkable color gradations might be employed opens up opportunities for truly custom work. Visibility also requires us to regard the plural nature of the band. We need to think in multiple units. Too often uniforms or performance wear are envisioned as single garments, and assembled with whatever lines and shapes seem to work when observed one-at-a-time at close range. Inevitably, the uniform seems too busy and distracting when seen in multiples, in a large group. The uniform should look handsome, of course, but it must also relate to the others around it in a manner that melds the individuals into a handsome whole. Certain angles, shapes and trims, when seen in a group can actually diminish the scale of the band, or cause distracting patterns to emerge, pointing out the differences in size and shape of the performers. The ideal mission of a uniform is to, in fact, make everyone look uniform. Visibility demands that we control what the audience sees, what their perception of the band will be. For example, initial conversations can center around something small, like the edge color on striping for the pants. But if you’d consider the pants’ visibility, you’d immediately question the need for a stripe at all. Because we know that modern drill relies heavily on curvilinear forms that reduce the effectiveness of stripes by revealing different angles of different performers’ legs at the same time, we know that the stripes actually make the group look imprecise. Another example might be white shoes, or spats, with black pants. At close proximity, this idea seems like an accent, perhaps even a way to highlight some marching effect or other. But when we consider visibility, and what the audience will see from their vantage point, we know the slimming quality of the black pants will take a back seat to the white shoes, and the actual effect will be something more like Minnie Mouse. Identity emphasizes several elements that combine to give your band its special style and character. The very soul of your group needs to be evident from the first viewing by an audience, as well as by the first wearing of the performer. The unique ability to communicate personality and spirit need to be addressed in a uniform. Simply cloning and existing popular group only breeds imitation and derivative looks. While you may admire the appearance of a specific band, color guard, dance team, or drum and bugle corps, you need to choose which elements are consistent with your vision of the band’s character. Identity insists that the traditions of an established band are honored, becoming elements in your new design. The school colors, the team or band mascot, and the band’s own name are existing elements of the brand and bear a direct relationship to the nature of your new uniform. Always consider the fundamental elements that create the nature of the band’s identity in the first place. Ask the questions “What does the band mean to the school?”, “What does the band mean to the parents, boosters, and community?”, and directly, “What does the band mean to the participants?” Often, your traditions need a good editor. Simply repeating an agglomeration of outdated customs and looks does not generate a handsome garment of style and clarity. Select the most prominent or significant elements to be featured, and retire the rest. Identity demands that your brand involve the addition of innovative elements that are unique to you and your band. Your own interests and goals are going to affect what inventive and pioneering concepts you’ll want to employ. What ideas keep you up at night? What images inspire you? You’ll want to incorporate these abstract intangibles with the support and help of your designer. Identity suggests that you reflect upon your aspirational goals and those of the brand. This way your group can appear to already convey the characteristics it seeks to develop and master. Who and what does the band want to be? How do we project an image that elevates our presence and sets an expectation level in the viewer and performer? Identity also asks you to recognize what the “state-of-the-art” organizations are doing nationally and regionally. It is important to observe, evaluate, and assimilate the works of the best bands, not only in your arena of performance, but those performing on the national stage. The band that most resembles your personal benchmark for excellence, both musical and visual, can become a true course of study. Adapting the contributions of these groups of various sizes and instrumentations to your band allows you to keep up-to-date, and adept at the current vocabulary. In doing so, you avoid the traps of overt regionalisms or administrative logjams. Too often the band is expected to look just as it has for many years, even though the cheerleaders and sports teams have kept pace with the latest developments in uniforms for their activities. Every brand deserves to be refreshed and reinvented for the current generation of audience. Practicality concentrates on the pragmatic elements of engineering, patterning, and manufacturing uniforms and performance wear, and the ability to withstand the rigors of modern athletic visual programming. It’s important to consider the high level of durability required by today’s physical efforts, while at the same time considering the environmental concerns regarding the manufacture and care of uniforms. Marching bands have begun to avoid the old-style uniforms filled with horsehair canvas, interfacing, and low grade linings. Of the pattern types popular from 30 to 50 years ago, recent versions have proved to be uncomfortable under performance duress with plastic inserts and metal hooks in collars, using sewn or metal loop-and-washer buttons. With the recent availability of lightweight, breathable fabrics which are perfect for athletic use, a totally new generation of washable band uniforms has gained popularity. In addition, by using the latest technological know-how, your brand can now become more self-aware, and world-aware. Practicality demands that today’s uniforms are designed and specifically intended to be laundered under regular household conditions with no fading or discoloration, avoiding the chemically-based and environmentally problematic dry cleaning process. Cleaner and fresher, the laundered garment leaves a smaller footprint on the environment as well, saving monetary and environmental costs. These modern garments are patterned to hold a tailored shape, featuring modern developments like built in gussets for full-range movement, crushable collars, and sewing-free hems. Alterations should be easily gauged and equally easy to perform. The advantages of back-zip closures, polymer fasteners, and adjustable elements allow for better fit and ease of movement. Throughout the course of establishing a visual hallmark for your group you also create a strong component in establishing or improving the brand that is your band. While your training and experience are based in musical disciplines, with the right knowledge, you can utilize the visual facets of the band experience to create a broader, more intense appeal to potential members, audience, administration, parents, and boosters. With design credits for Broadway, TV, and Las Vegas, designer Michael J. Cesario holds Professor Emeritus status from New York’s Purchase College, where he was Director of Design/Technology and Graduate Studies for Theatre Arts and Film. He has taught at Dartmouth College, NY School of Visual Arts/MFA, the University of Illinois, and the Juilliard School. His work has been published in several design texts. Recognized as a national leader in pageantry arts, he is in demand as an adjudicator and clinician for high school bands and consultant for world class drum and bugle corps. As the exclusive uniform designer for Fred J. Miller Inc, his innovative, bold, contemporary designs are being worn by some the world’s most prominent bands and drum corps. Michael is a member of Phi Mu Alpha Sinfonia Fraternity as well as the distinguished Drum Corps International Hall of Fame.